Ahh there is something so special about a newborn session with brand new parents. The way they look all googlie-eyed at their precious baby and how they hold them with the most of care. It's a bit different than a session with seasoned parents and other siblings in the house. Everything is fresh and new and, without littles running around, the baby has 100% attention from mom and dad. All is calm. Unfortunately, this time is a blur and that is where I come in. To capture the first days that are so incredibly fleeting. Newborns are only so tiny and sleepy for a few weeks and then everything changes! I highly encourage you to let the household chores go and, instead, spend the moments soaking in their fresh newborn smell and soft fuzzy skin. Simply enjoy babe as she sleeps in your arms. Trust me, the house is going to be forever messy going forward, but this stage of your child's life is the shortest! They will never be this itty bitty again! 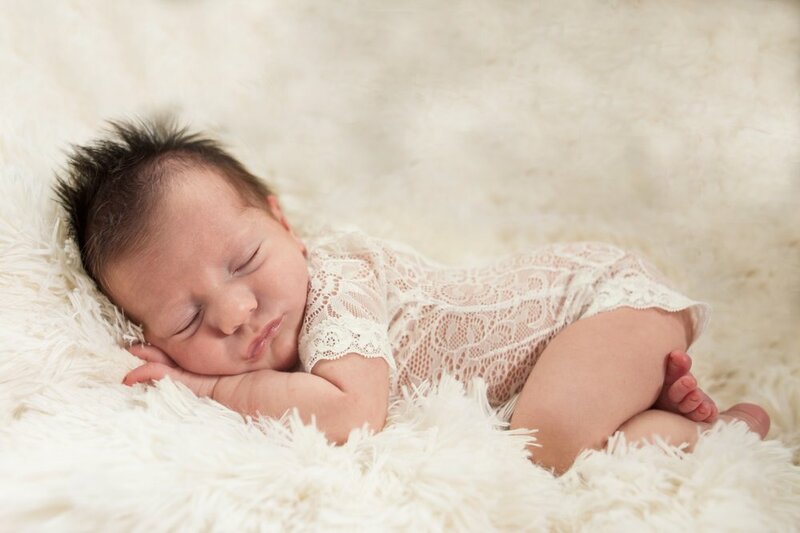 It's not necessary for a baby to be asleep for my newborn sessions. I embrace the awake moments as baby meets momma. the little hairs on the back that will soon disappear, the wrinkly toes - all the details. I am always thankful for the incredible honor of capturing these moments for my families. I first met mom and dad when sweet Rosalyn was still in momma's belly. They were so excited to meet her and their Mt Falcon maternity session was gorgeous! And now I had the opportunity to photograph them again, this time in their home, as they welcomed their baby girl. We had such a lovely morning of snuggles and getting to know this sweet girl. Mom is just over the moon to have her home and in her arms. Although I must say, I have never had a baby poop so much in ONE session - this girl just kept going! LOL! I thought the kitchen was neat and wanted to use it for some of the photos. Although it was a super cloudy day and there was not much light, I loved the moody feeling it created in these photos. It was very different from the bright and airy nursery and I love the variety it added to the gallery! How cute is this little lace outfit? Of course it was peed and pooped on over and over - but we at least managed to get some adorable photos with her in it! Welcome to the world sweet girl.